Tillakaratne Dilshan and Upul Tharanga starred in a record 282-run opening stand to set up Sri Lanka's 139-run victory over Zimbabwe and help them qualify for the quarter-finals of the World Cup in Pallekele on Thursday. Faced with the uphill task of chasing Sri Lanka's 328, Zimbabwe were bundled out for 188 in 39 overs as Dilshan, following his blazing knock, shown with the ball too, picking up four wickets to cap off a memorable day in the field. The 268-ball partnership between Dilshan and Tharanga is the second highest in the history of World Cup. Dilshan blasted 16 fours and a six to score a 131-ball 144, while Tharanga plundered 17 fours en route to his 133, to guide the 1996 winners to a mammoth 327 for six in a group A encounter at the Pellekele stadium. In pursuit of a stiff target, Zimbabwe openers Brendan Taylor and Regis Chakabvaset set the stage for an exciting finish by putting on a century stand, but the chase fell after Taylor was snapped up by Angelo Mathews. During an opening stand that yielded 116 runs, Taylor was the more aggressive of the two, racing to his fifty in quick time. He was helped by a wayward Lasith Malinga, pouncing on his loose deliveries to score quick runs, before Muttiah Muralitharan fooled Chakabvaset with a doosra to break the partnership. The dismissal of Taylor in the 25th over, however, was the biggest blow to Zimbabwe's hopes, and the Africans could never recover once he was gone. Apart from Dilshan's 4/4 -- he could have taken a hat-trick had Mahela Jayawardene latched onto Graeme Cremer's edge in the 30th over -- Muralitharan took three while Mathews finished with two wickets. Ironically, it was the Lankan vice-captain's spectacular diving catch on the left, which put Dilshan on a hat-trick. Zimbabwe lacked batsmen with the ability to dominate after Taylor's departure, and the inevitable was delayed thanks to the islanders' inconsistency in the field. Besides Jayawardene, Muralitharan spilled one off Malinga in the deep. It was always going to be a difficult task for the minnows after being at the receiving end of Dilshan and Tharanga's onslaught for almost the entire Lankan innings. The Lankan duo's stand is also the second highest first-wicket partnership in the history of international cricket, besides being the fourth-highest for any wicket in one-day internationals. The highest first wicket partnership of 286 also belongs to Tharanga, which he scored with veteran Sri Lankan opener Sanath Jayasuriya against England at Leeds in 2006. - Cup Camera: Pacers being overshadowed? 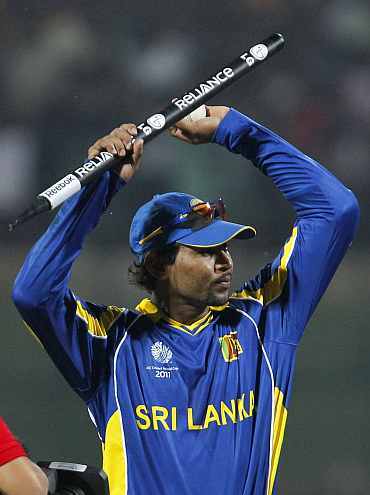 Dilshan also missed the record for the highest runs in an innings by a Sri Lankan in a World Cup by a whisker as he finished one short of Aravinda de Silva's 145 against Kenya in 1996 World Cup. Opening the innings after being sent into bat, Dilshan and Tharanga picked the Zimbabwean attack by the scruff of its neck and indulged in fours and sixes to give their team a flying start. Tharanga started the proceeding with a boundary in the fourth ball of the first over but it was Dilshan's blitzkrieg in the second over off Panyangara that set the tone for their huge score. The right-handed batsman, blasted three fours and a six in four balls to accumulate 18 runs off the second over, before playing his favourite scoop over square-leg and fine-leg for another boundary. Price was at the receiving end in his first spell when Dilshan drove him past short extra cover, lifted him over mid off and then pulled one over square leg for three boundaries. In no mood to stay behind, Tharanga repeated the treatment to pacer Chris Mpofu in the 10th over, picking up three fours off him. 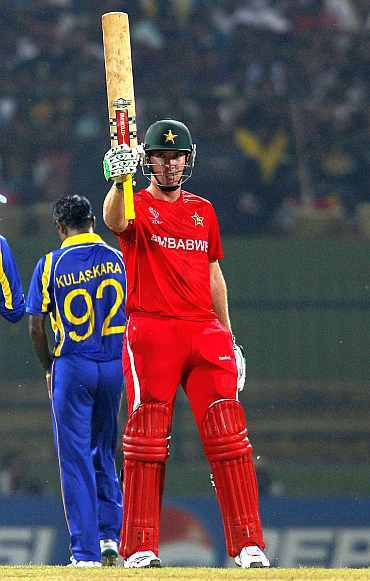 Skipper Elton Chigumbura then introduced himself into the attack but Dilshan sent him across the third man boundary. None of the bowlers got any respite as Dilshan treated them with equal disdain. In the 16th over, Dilshan slashed hard at a Prosper Utseya delivery and his outside edged flew to the third boundary for a four, while in the next over off Graeme Cremer, he sweeped him wide of short fine leg to bring up the hundred for Sri Lanka in 16.1 overs. Dilshan brought up his personal hundred with a couple of fours off Chigumbura in the 31st over, while Tharanga also picked up two boundaries one over later to keep pace with his opening partner. 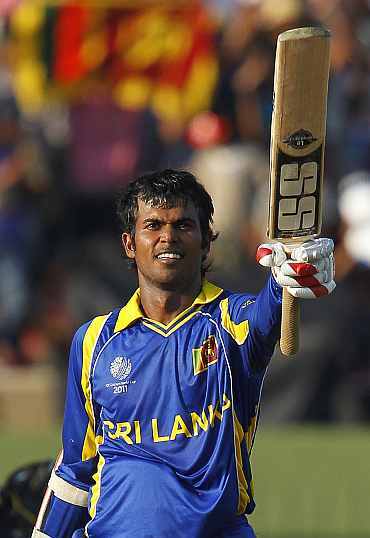 He took Sri Lanka past the 200-mark in the 34th over, hitting Utseya for a boundary. In the 41th over, Sri Lanka took their batting powerplay and Tharanga exploded with consecutive fours off Price, before blasting three boundaries off Lamb as the Islanders crossed the 250-mark. Their brilliance conjured up the hopes of breaking the world record for the highest opening partnership of 286 but the duo fell short when looking to accelerate Tharanga was dismissed by Mpofu in the 45th over. Six balls later his opening partner Dilshan also holed out at deep midwicket off Utseya, while a wild slog cost first down Thisara Perera his wicket. In pursuit of quick runs, Sri Lanka lost former skipper Jayawardene (9), Matthews (0) and Chamara Silva (4) in the 48th over off Mpofu before skipper Kumar Sangakkara pushed the score further with a couple of fours in the last over.